Roy Eldridge was a virtuoso trumpeter who extended the trumpet's range and its playing style and his playing led to the development of be-bop. "Little Jazz" was born on January 30, 1911 in Pittsburgh, Pennsylvania. As a young boy he played drums and tuba and bugle before beginning to play trumpet. His earliest teacher was his older brother Joe, who was an alto sax player. At age 16 he ran away from home as the leader of a teenage band that was playing music for a small touring company. When the company folded, he got stranded on the road and then got on with a Carnival where he played trumpet, tuba and drums. He came back home to Pittsburgh and formed another band which gigged for a couple of months and then began to play with some of the best territory bands in the Midwest. He played with Horace Henderson, Zack Whyte, Speed Web, and Johnny Neal's Midnight Ramblers. With the Midnight Ramblers he had his first experience playing on the radio at a club in Milwaukee. In late 1930, he arrived in New York for the first time and he was soon playing with the best bands in Harlem. He played with Cecil Scott, Charlie Johnson, Teddy Hill, and Elmer Snowden. Snowden gave him the nickname" Little Jazz". While playing with Teddy Hill, Little Jazz also backed Billie Holiday on some early recordings.He did not cut his jazz teeth in Chicago with the musicians from New Orleans. His early influences were Red Nichols, Jabbo Smith, Bix Beiderbecke and more importantly Coleman Hawkins and Benny Carter. Coleman Hawkins brought a fluid legato up-tempo style to the saxophone. While Louis Armstrong was playing a trumpet with lots of arpeggios and vertical melodies, Roy Eldridge playing in a more linear fluid style in the manner of a saxophone. Eldridge stated: "The sax players would run changes, would run through all the passing chords and things" He also said "I play nice saxophone on the trumpet" Little jazz also had a remarkable range and he played high whistling notes with regularity. In both his rapid fluid scale-like runs and his use of the upper range of the trumpet, he was an innovator. He had a very brassy tone and frequently "cracked" his notes - giving him a dirty sound. In 1935 he was playing with Teddy Hill's band at the Savoie Ballroom. This band had several fine musicians including the great tenor saxophonist, Chu Berry. Chu Berry and Eldridge became fast friends and played together and traveled to cutting contests together until Chu Berry was killed in a car accident in 1941. Teddy Hill's band was broadcast nationally over the radio and Eldridge's soaring and wildly inventive horn was broadcast to the nation. A young Dizzy Gillespie listened to many of these broadcasts and admired him so much that he tried his best to play like his idol. After leaving Teddy Wilson, Little Jazz, like many other early jazz greats, the honed his craft in the Fletcher Henderson Band. In the late 1930s, the great Louis Armstrong was playing more conservatively than he had when he was younger. Roy Eldridge stretched himself out every time he played and was never conservative. Little Jazz was the premier swing jazz trumpeter of the late 1930s. In late 1936 Roy Eldridge left the Fletcher Henderson Band and went out on his own. He was the leader of a band with a great rhythm section and in 1937 made some of his very best early recordings. Among these were "Hecklers Hop" which had two hot choruses played by Eldridge. In this song one can hear the forerunner of bebop. He also recorded "Wabash Stop" which was flowing and beautiful and "After You've Gone" in which Eldridge played similarly to Louis Armstrong , whom he had come to admire greatly. In 1941 Roy Eldridge broke the color line when he joined Gene Krupa's big band. He provided solo excitement and high note pyrotechnics for Krupa. He later also played with Artie Shaw. Little Jazz had a great influence on Dizzy Gillespie -one of the founders of bebop. Although he played with most the early bebop stars, he did not make the switch to bebop. Feeling out-dated musically, Eldridge moved to France for a year and came back to the United States reinvigorated and committed to playing his own brand of swing jazz. He continued to play as a virtuoso trumpeter in several venues. he made some great recordings with Coleman Hawkins and Benny Carter and also toured with Norman Grantz's Jazz at the Philharmonic on a regular basis and recorded for Norman Grantz. 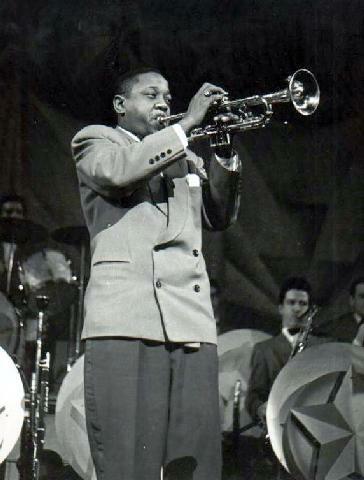 His trumpet playing was stopped by a heart attack in 1980 and Roy Eldridge died on February 26, 1989. Known as the musical bridge between Louis Armstrong and Dizzy Gillespie, Roy Eldridge was also a hugely important jazz trumpeter in his own right. Little Jazz [CBS] (1991) - (1935-1940) Single CD compilation of the best recordings of his early work. Little Jazz: Trumpet Giant (2004) - 4 CD compilation of the best of his career by Britain's Proper Recordings, known for good quality sound and good value.